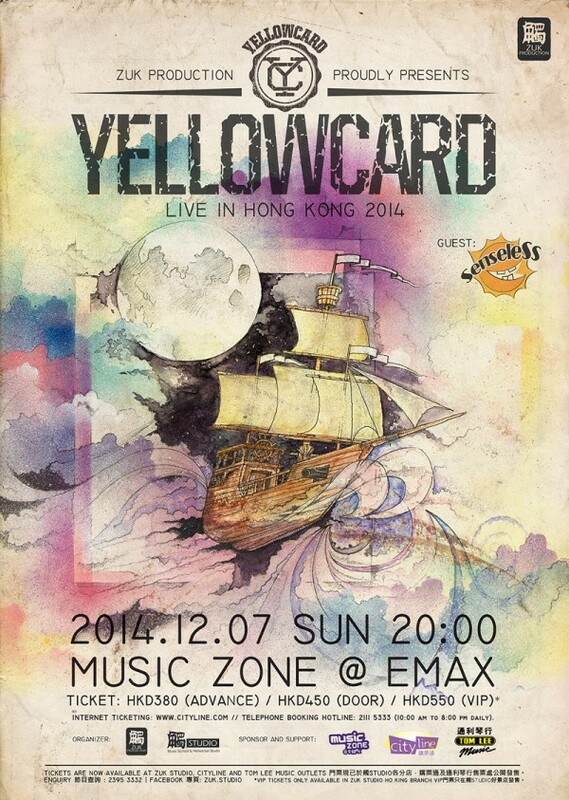 Pop punk / alternative rock band YELLOWCARD, will be performing in Hong Kong on 7 December 2014 at KITEC, Music Zone! The punk rockers, arguably most well-known for their 2003 hit “Ocean Avenue”, released their 9th studio album, Lift A Sail, in October 2014, which spawned singles “One Bedroom”, “Make Me So” and “Crash the Gates”. The heartfelt title track, “Lift A Sail” is also a dedication from lead singer Ryan Key, to his wife, pro-snowboarder Alyona Alekhina, who suffered a paralysing spinal injury while training for the 2014 Winter Olympics. In a letter Ryan published online to his 10 year younger self last year, Ryan talks about their story, how the traumatizing event changed their lives, and how it changed what Yellowcard meant to him. Below is the letter in full, but you may want to grab a few tissues before you start reading. It’s 2013. I am about an hour outside of Moscow spending a couple days off from tour between Korea and Europe at your wife’s family country house. Yes, I said wife and tour in the same sentence. You’re 33 and still touring the world and you’re married to the girl of your dreams. She’s a pro snowboarder from Russia. You’re going to meet her at a Yellowcard show in Madrid, Spain on your 32nd birthday and ask her to marry you a year later. Don’t worry, she says yes. But you won’t be planning on getting married for quite a while after that. Then, on April 23rd 2013, she will be training for the 2014 Winter Olympics in Mammoth Lakes, CA and have an accident that will change your lives forever. Her back will be broken and she will be paralysed below the waist. Two things will happen to you. First, staying by her side and marrying her in the hospital just two weeks after the fall will show you what it really means to be a man. It will place all of the moments that have seemed so impossible and heartbreaking in your life up until then in a shadow behind this unthinkable tragedy. But you will be strong. You will finally understand what it really is to love someone more than you love yourself. And that is a lesson that you, my friend, really needed to learn. The second thing is you will find a whole new meaning for Yellowcard and everything that comes with it. The importance of finding magic in every moment along the way will be made clearer than ever. You will feel that fire in your heart when you look out at the crowd like never before. So I guess the best advice I can give you is, stay the course. I am living it now and I know you can do it. Nothing you have planned for your life will happen the way you want it to so just roll with the punches and remember that just like Anakin, there is good in you still. Be well, bud. May the Force be with you. Tickets for the gig are $380 and $450 at the door. Limited VIP packages ($550) can be purchased exclusively at Zuk Studio, Ho King Branch, with priority entrance and a meet & greet with the band. Regular tickets can be purchased online at www.cityline.com, or at Zuk Studio and Tom Lee branches.